It's a tough time for elephants – our planet's most iconic, charismatic and ecologically significant species. The cruel ivory trade continues to thrive and decimate populations across Africa. 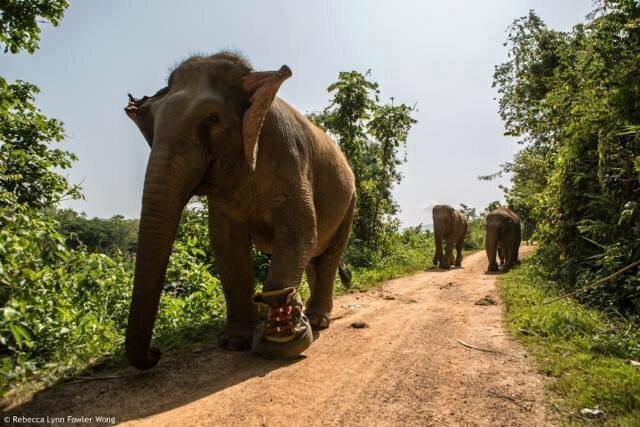 In Asia, disappearing habitats due to logging, urbanization and population growth, have driven once wild elephants to the cities or tourist camps where they face a debilitating lifestyle with low standards of health and long hours in adverse conditions. With 10% of Africa's elephant population lost each year, the next 10 years will decide the species' fate. To counter all of the forces that are aligned against the elephant, The Bodhi Tree Foundation has initiated the Power of 10 initiative, supporting 10 elephant conservation projects in 10 critical landscapes that can help make a difference in the future of the elephant in Africa and Asia. The Bodhi Tree Foundation has carefully vetted and selected 10 elephant conservation projects with organizations such as Big Life Foundation, Uganda Conservation Foundation and Wildlife Alliance in Africa and Asia to counter poaching, reduce human-elephant conflict, protect habitats, and provide vital veterinary care for elephants. The foundation is appealing to organizations and individuals to help raise $10,000 for each project by December 8 – World Bodhi Day. 100% of every donation goes directly to the project of your choice. Travel partners - including Absolute Travel, Extraordinary Journeys, Elevate Destinations, Outside GO and Singita - have created a number of exclusive itineraries that give 10% of proceeds back to our 'Power of 10' projects. These unique trips allow travelers to see these gentle giants and the impact of these conservation programs first hand. Visit www.saveafricaselephants.org to learn more about the projects and travel opportunities and get involved.